The LANforge-CLI API Cookbook provides a series of detailed examples of how to craft testing scripts for unattended/automated operation. Each example intends to give the reader a runnable test script and a better understanding of how to use the LANforge-CLI API. You do not need to operate scripts directly from the LANforge server, and this allows you to code scripts in your preferred text editing environment. Likewise, you do not need to run a copy of LANforge Server on your desktop. 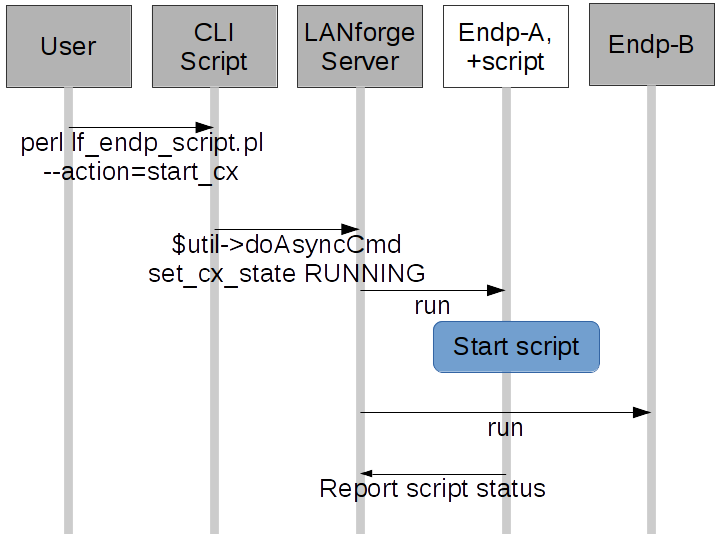 Scripts will create a plain-text connection to the LANforger server you specify. You can install a copy of the LANforge Server on your windows desktop (without a license) so that you have access to the Perl scripting libraries. Edit scripts and run them from your C:\Program Files\LANforge-Server\scripts directory. 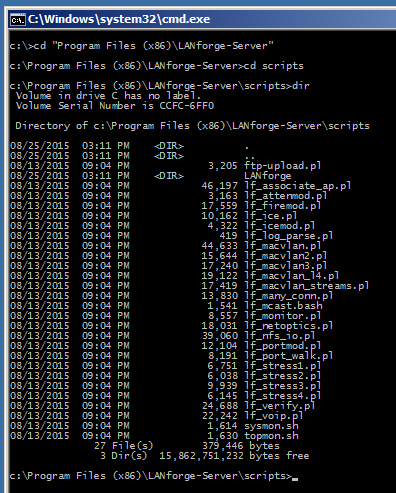 You can copy the LANforge scripts folder directly from your LANforge server to your Documents directory with scp. 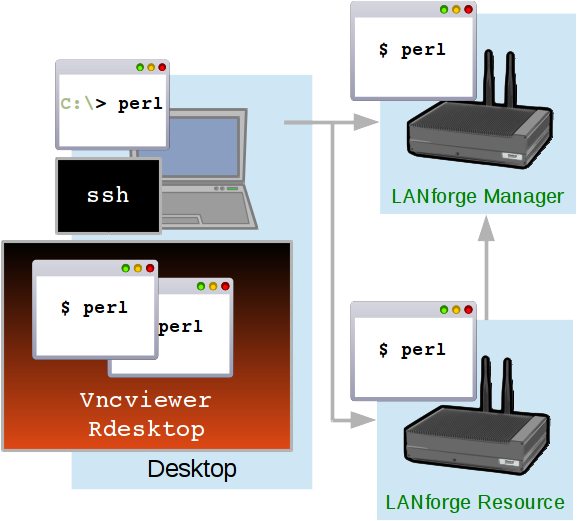 Using vncviewer, rdesktop or ssh are all fine options to connect to the LANforge server to write and operate scripts. The LANforge server comes with a basic Linux desktop and you can use emacs, vim, pluma, or gedit text editors installed by default. When editing scripts on the LANforge server itself, be careful to back up your work before you upgrade LANforge. The LANforge install process will over-write scripts of the same name in the scripts directory. Your desktop (or other computer) running CLI scripts needs to have a reliable (wired) connection to the management port of your LANforge server. If you are engaging in long running tests, you might consider running the scripts from the LANforge manager itself if your desktop machine needs to be powered off. CLI scripts are written using Perl. They require the libraries in /home/lanforge/scripts/LANforge Users may write scripts in other programming languages, such as python, but in that case, they will not be able to take direct avantage of the Perl scripts included in LANforge. LANforge is more fully featured on Linux, but basic support exists on Windows as well. You can run CLI scripts from any Windows desktop as long as you have Perl installed. 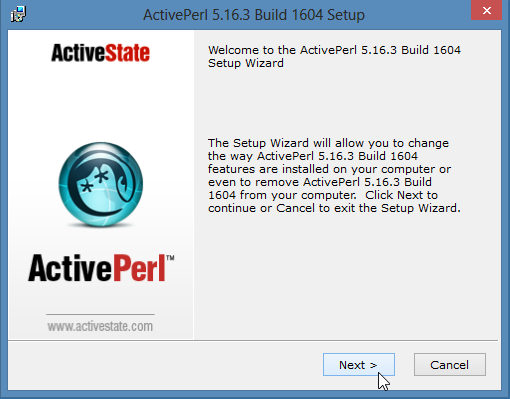 You can use ActiveState Perl or Perl from the Cygwin project. We also highly suggest installing PuTTY ssh client to access your LANforge server. Most Linux distributions come with and ssh client and Perl already installed. Please contact us at support@candelatech.com if you have any questions. Goal: You will be able to execute LANforge testing scripts from the command line from Windows, Linux, remote desktop or ssh connection. Traffic emulation may be run unattended and automated using Perl scripts provided with the LANforge Server. These scripts can be run from within the LANforge server or outside the LANforge Server (on a Windows or other desktop). 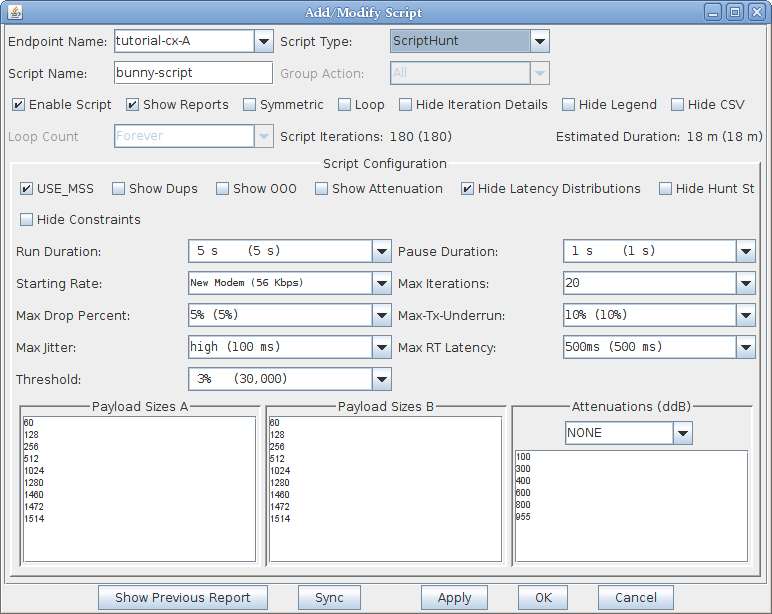 The output of the scripts should be redirected into a text file for you to process the results. Type perl .\script_name.plENTER to run the script. Generally, the script will tell you that it needs more switches. Most scripts have a -h or --help switch that explain what switches they expect. 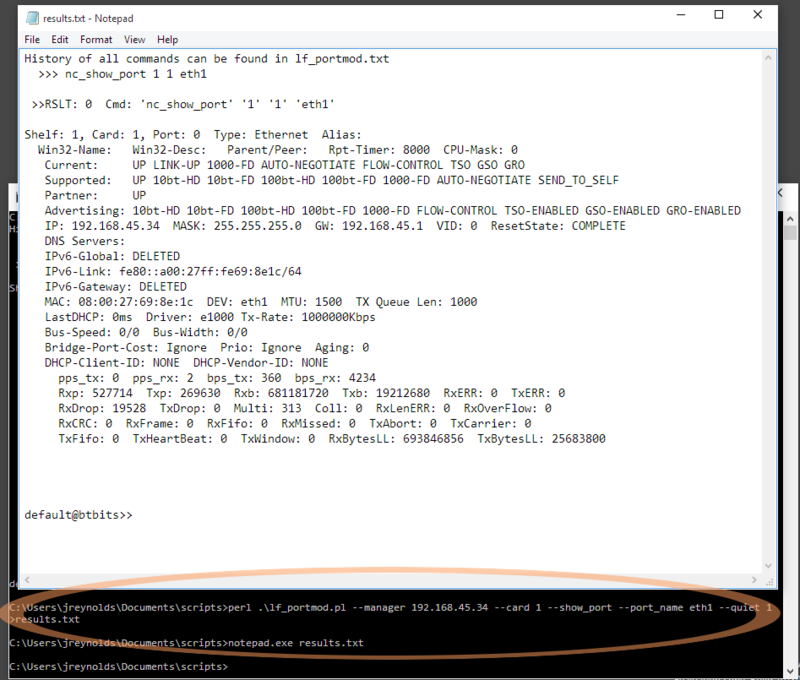 The manager IP address to connect to:--mgr 127.0.0.1 or --manager 192.168.100.1. This often defaults to 127.0.0.1, but when connecting from outside the machine, please use the IP of the LANforge management port (often eth0). The manager port to connect to:--port 4001 or --mgr_port 4001. This often defaults to 4001. To capture the output, use the > operator to redirect the text output into a text file. Comments begin with '#'. They are lines ignored by the shell, and they are also comments in perl. A more detailed set of steps follows. When running LANforge CLI scripts on a Linux desktop, you normally want to download and un-zip a copy of the LANforge-Server install file found on the Candela Technologies downloads page. 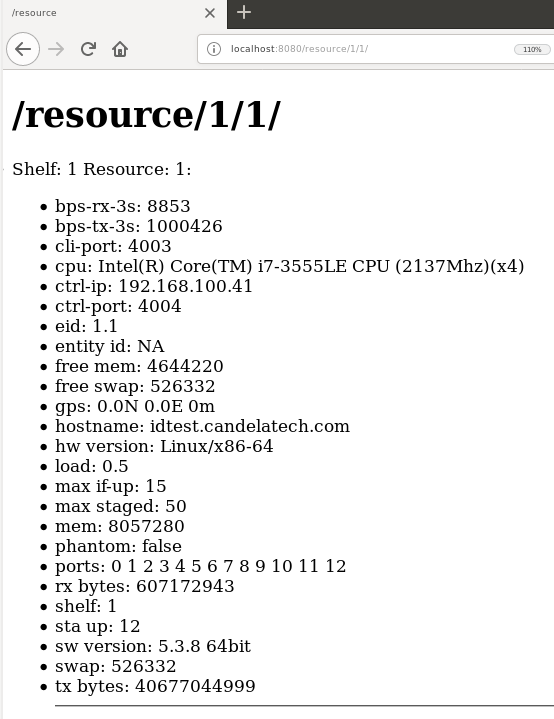 Use a link similar to: http://www.candelatech.com/private/downloads/r5.3.2/LANforgeServer-5.3.2_Linux-F21-x64.tar.gz. For best results, use the scripts packaged with the version of LANforge to which your scripts will be connecting. To use your scripts, in your terminal, change directories to ~/Documents/scripts and they will operate similar to the above examples. 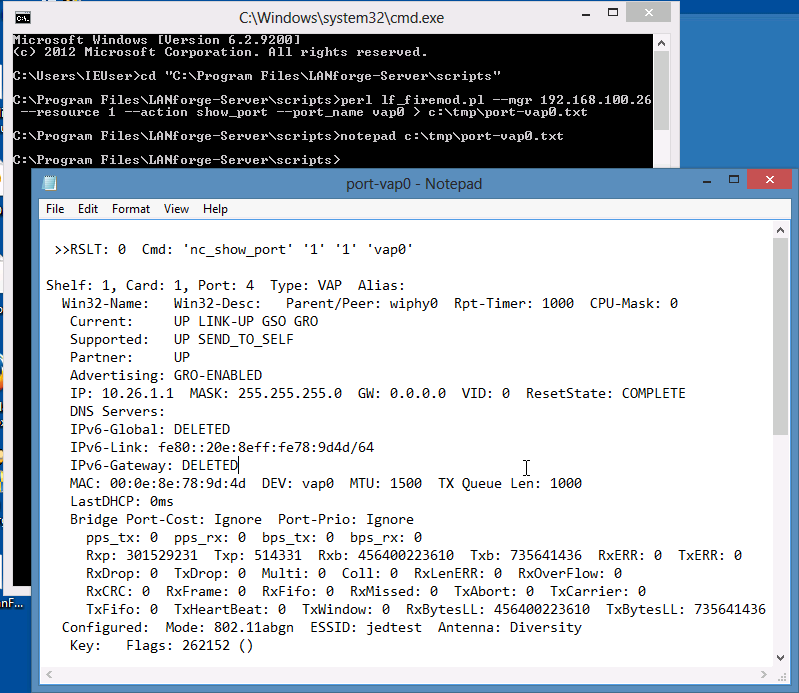 The process for running CLI scripts on a Windows desktop is roughly similar, but involves running the Windows LANforge Server installer. This process does not require a Windows license as we will not be running the windows LANforge server. Perl is required to run Windows scripts. Start by installing that. 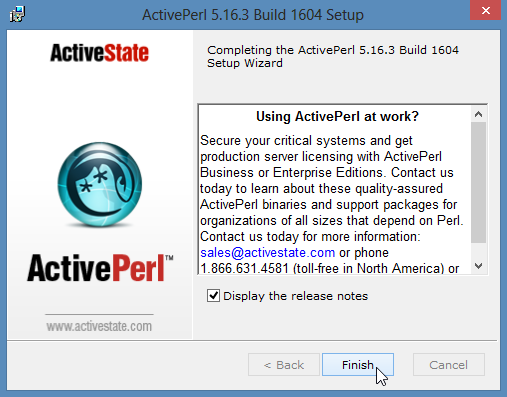 You can use the perl that comes with the Cygwin project or if you just want perl, install the ActiveState ActivePerl package. 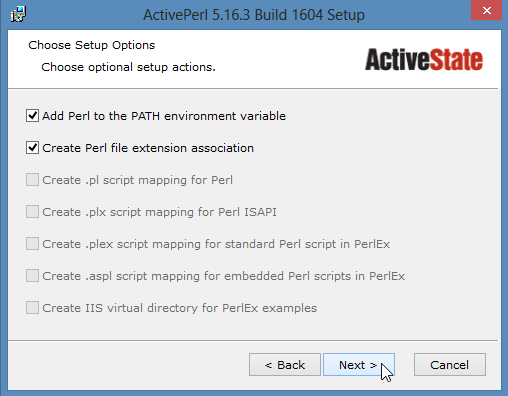 ActivePerl should install update your environment %PATH% variable. If it does not immediately, you might need to log out and log back in. 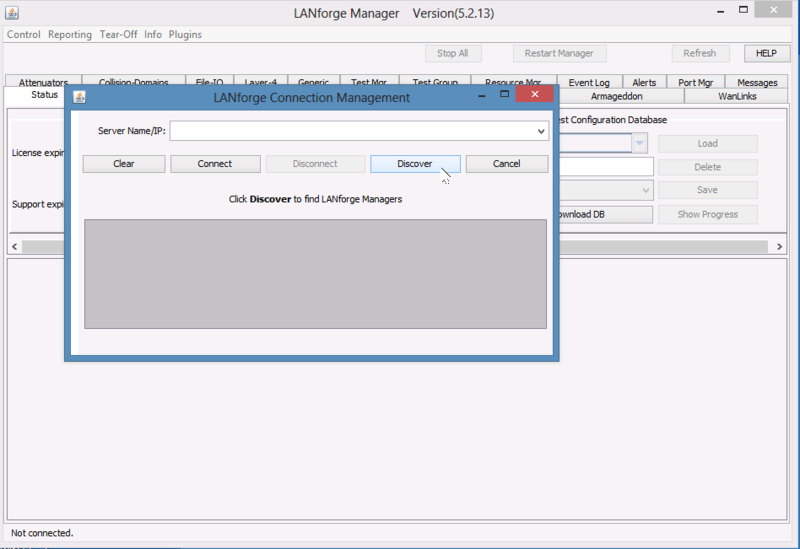 Download the Windows version of the LANforge Server installer using your browser: http://www.candelatech.com/private/downloads/r5.3.2/LANforge-Server-5.3.2-Installer.exe. Use username guest, password guest. 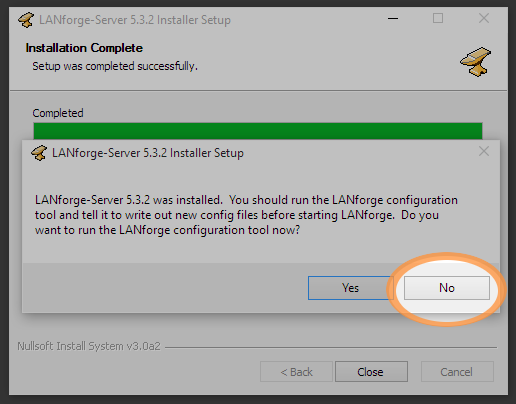 In your Downloads folder, double click and install the LANforge-Server-Installer.exe. Do not configure it, do not run LANforgeServer. You will not need to be running the LANforge GUI to do this install. 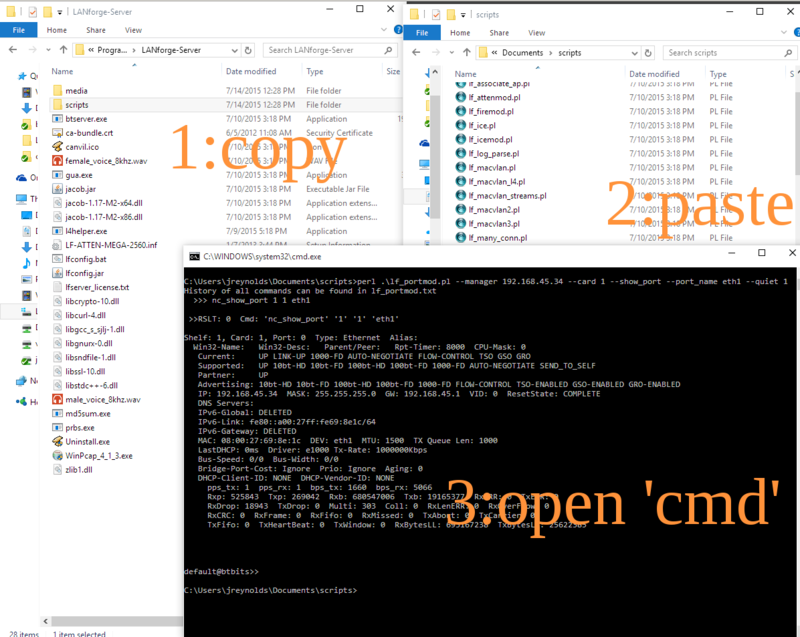 The installation scripts folder will be system-protected, so you want to copy the folder over to your desktop Documents directory. 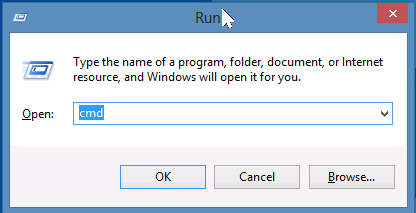 Operate LANforge Scripts from Windows. Goal: Use an installation of LANforge and Perl on a Windows computer to operate tests and manage connections on remote LANforge computers. 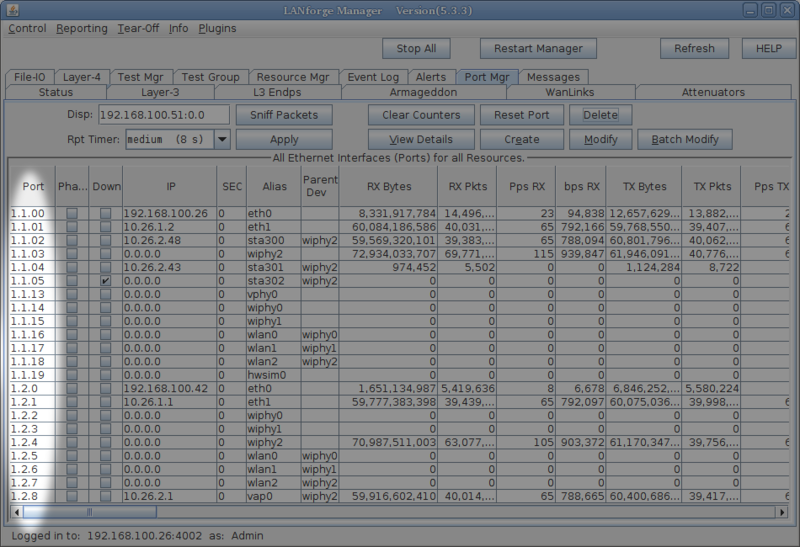 You do not need to connect to your LANforge manager using ssh or VNC to manage connections or operate tests. In this cookbook, you will see an example of using the lf_firemod.pl script which can give you port information. This example will require a Windows desktop with Java, ActiveState Perl, the LANforge Server and the LANforge GUI installed. You will not need to start the LANforge server on your Windows computer, so no licenses will be required for operating on the Windows computer. This cookbook assumes connectivity between the Windows computer and a running LANforge manager computer. You do not need to configure or start this server. 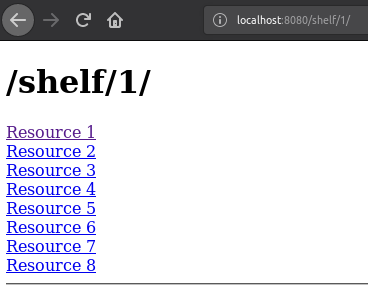 Only the perl scripts directory of this installation will be used. You can download it from our current releases page. You can download it from the same location. If you are able to connect you should be able to browse your ports and connections. 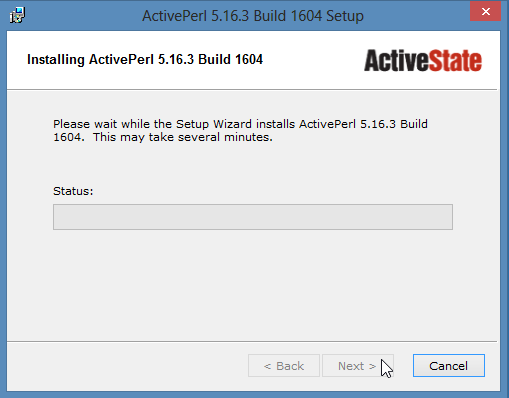 Please download it from the ActiveState downloads page. Now, you are done, press Finish. For advanced GUI scripting in Windows, you may also wish to view the Win32::GuiTest perl module page. The scripts installed on your Windows computer will communicate with the LANforge manager over the management port (TCP 4001). If perl is not found (Command not found) then you might need to close your DOS window and open a new one, or your Windows computer might need a reboot for the PATH variable to take effect. Start the lf_firemod.pl script with the --help switch to see the options. 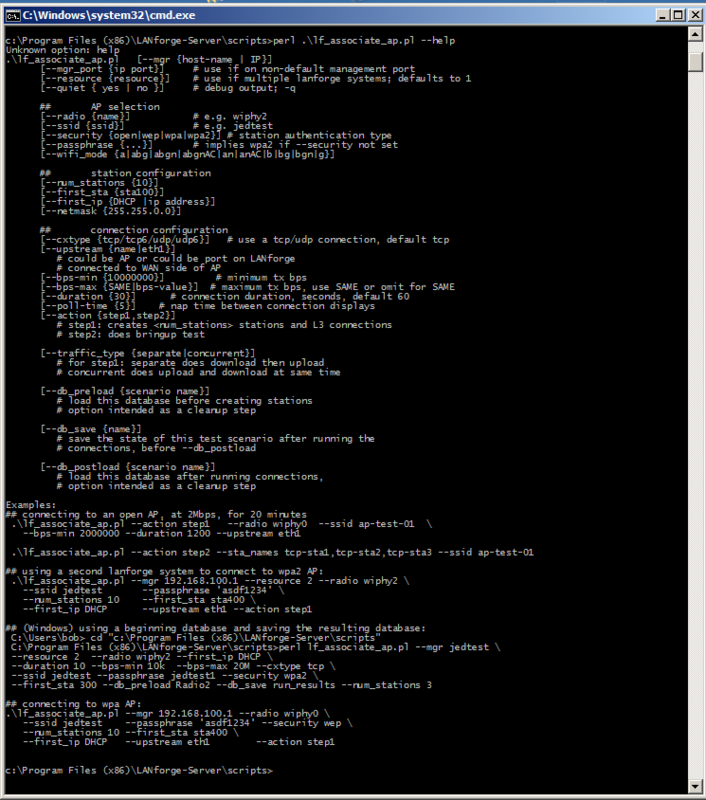 Most command output shows considerably more text than the output of the previous command. You may want to pipe it to a file. 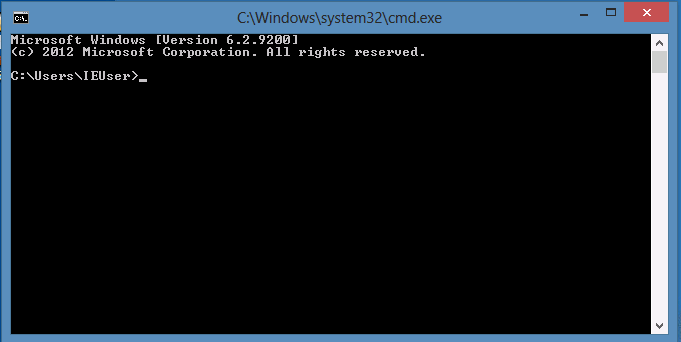 In this example, the output is redirected to C:\tmp\port-vap0.txt and shown with Notepad. Goal: You will be able to report and reset ports on your LANforge server. 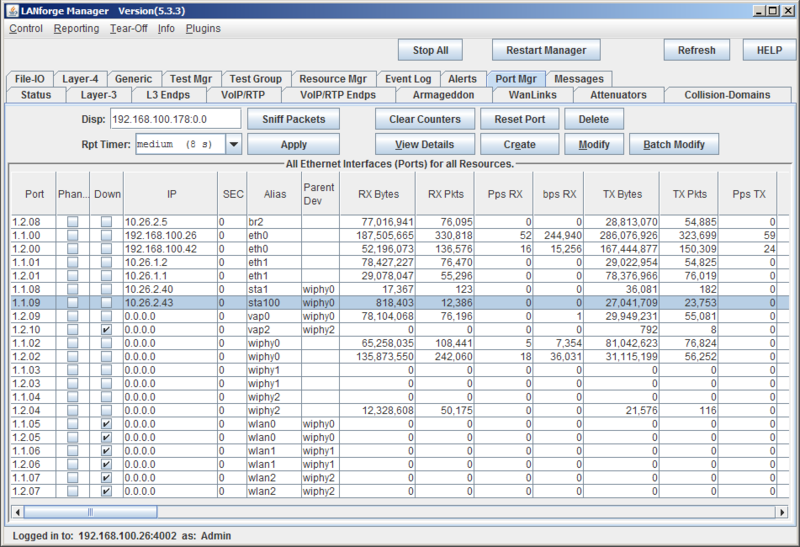 Port statistics can be programatically monitored using the script lf_portmod.pl. 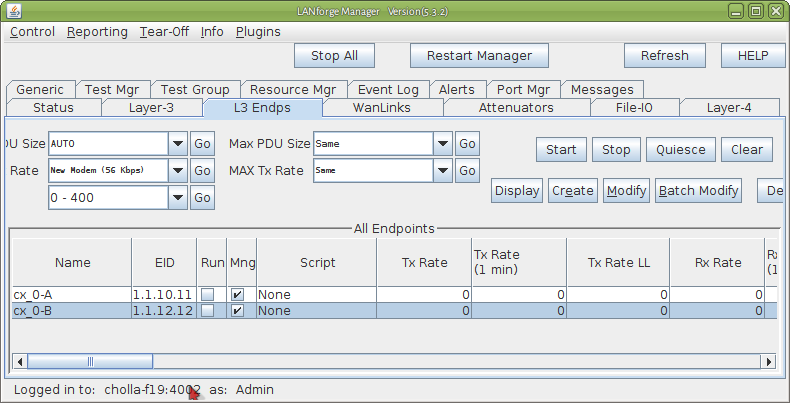 This script can also reset ports, alter WiFi station settings, and pass arbitrary LANforge CLI commands directly to the LANforge manager. Ports of all kinds can be viewed with the lf_portmod.pl perl script. You can also do some limited manipulation of ports as well. 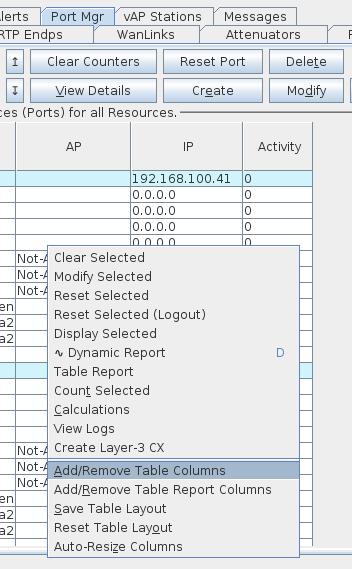 Individual port attributes can also be shown, which often makes automating reporting easier. 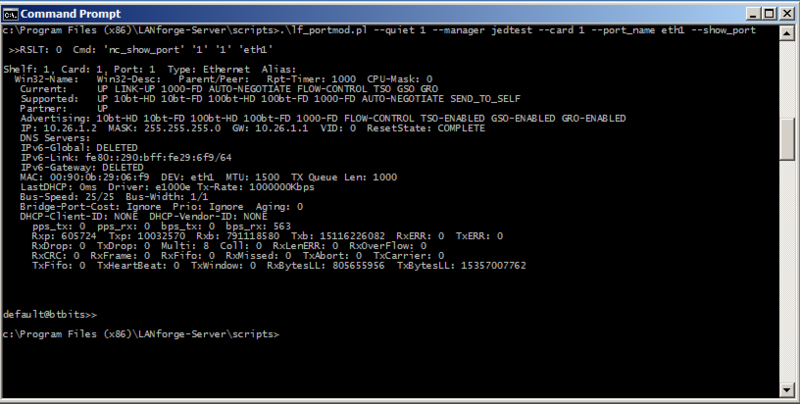 perl .\lf_portmod.pl --manager jedtest --card 1 --quiet 1 --port_name eth1 --show_port "RxDrop,Rxp,IP"
Produces: Consider that is a lot of text to type. If we want, we can reformat that command. Long DOS commands and be continued on the next line with the ^ character. This matches the same database name seen in the Status tab database dropdown. 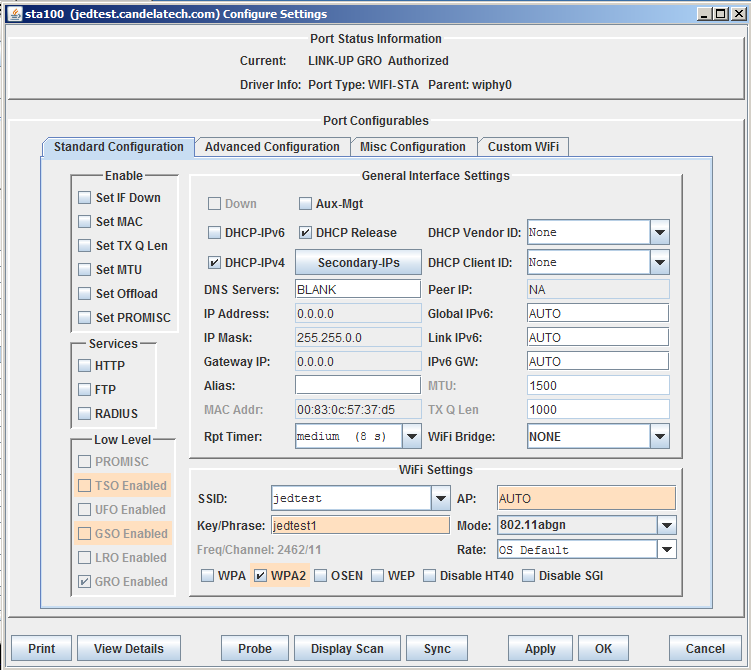 Resetting a port forces a port to unload and reload its configuration. 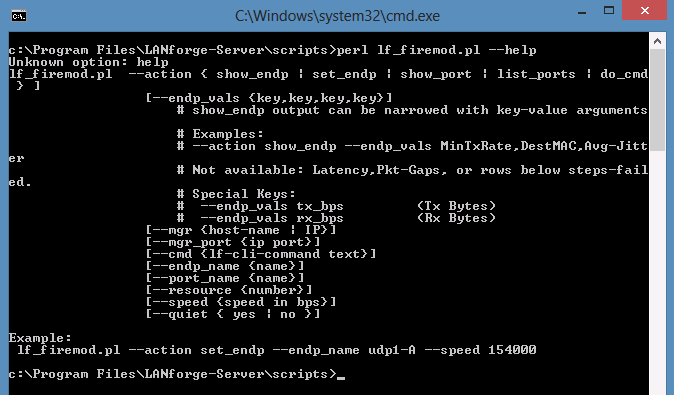 lf_portmod.pl --manager 192.168.1.101 --cli_cmd "scan 1 1 sta0"
Goal: Gain a better understanding on how you will use Cross connects, Connections and Endpoints to use the LANforge CLI scripts knowlegably. 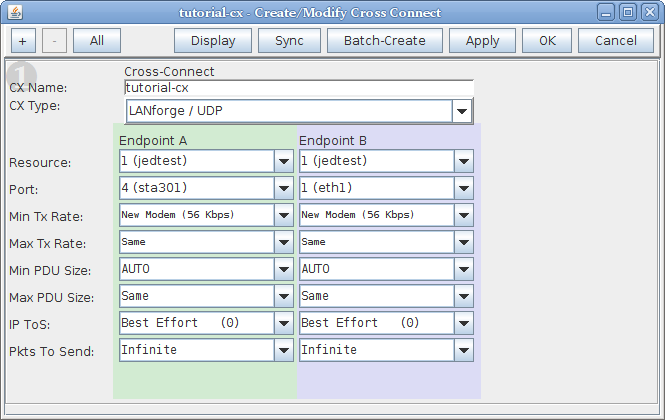 Creating connections in the LANforgeGUI implies creating endpoints. These endpoint entities are created with predictable names and are usually created in pairs. Understanding these naming conventions and how they are created is fundamental to your proficiency with creating connections with LANforge CLI scripts. Most examples in our cookbooks assume a dual-ended connection, also known as a cross-connect or abbreviated as CX. That's a lot of commands. We will point out what is particularly necessary when using our Perl scripts. The connection we created above is named tutorial-cx. 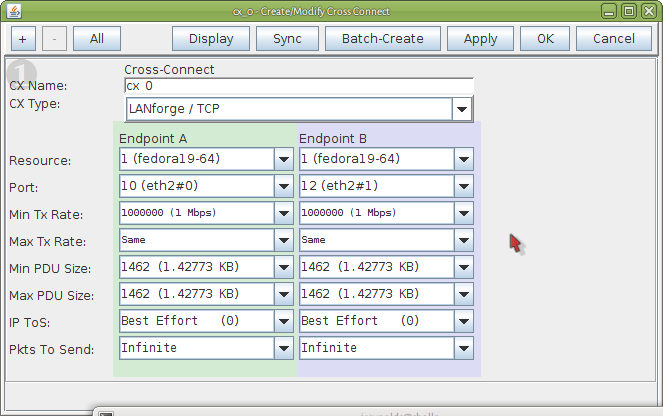 Two endpoints also have names, tutorial-cx-A and tutorial-cx-B. The A-side of a connection is always managed. A B-side endpoint may be unmanaged. When you write CLI scripts that create connections, name your endpoints using a similar convention. Multiple Windows can be displayed using the Tear Offs menu. Clicking on the Layer-3 connection automatically highlights the two endpoints. When a connection is first created, it is STOPPED. When you start it, it becomes RUNNING. When you set a connection to STOPPED, both endpoints immediately stop sending and recieving. That can have a consequence of leaving unacknowledged packets in flight. The safest way is to QUIECE the connection, which first stops the endpoints transmitting, waits a short time, and then stops the endpoints from recieving. You have paused between creating the first and second endpoint for a connection. Continue working. A single endpoint is not an illegal entity, but lonely endpoints can add confusion. If you find endpoints that do not match any existing connections, we suggest deleting them. A Cross-Connect can be one-sided, that is, have one unmanaged endpoint. The A side endpoint is a LANforge managed port transmitting to another device that's not a LANforge machine. Some connection types create this style of endpoint pairs, like File-endpoints and Layer-4 connections. 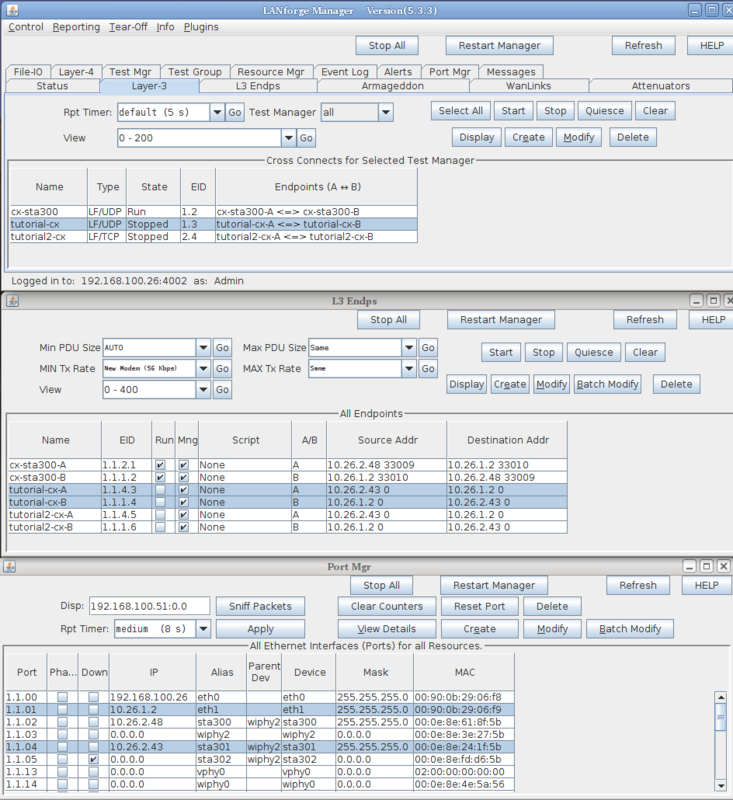 Multicast endpoints are created differently both in the GUI and in the CLI scripting environment. 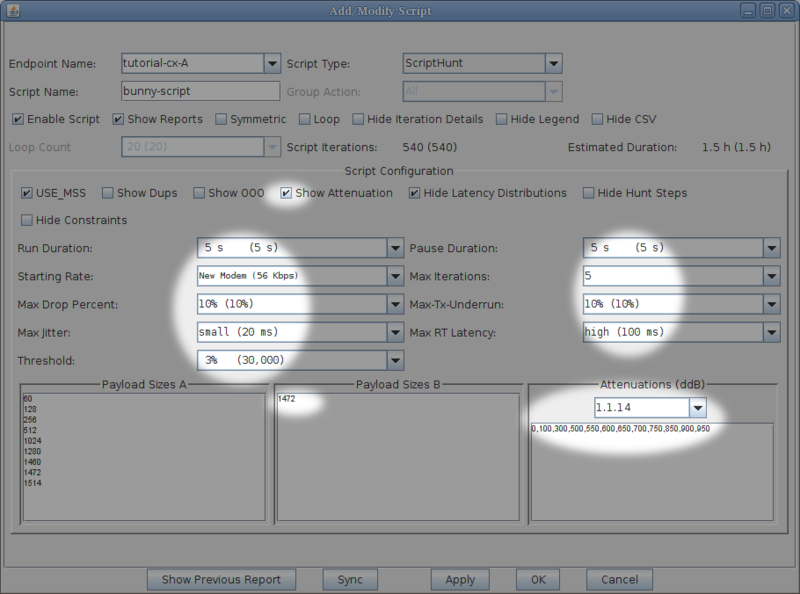 This tutorial does not focus on multicast, but see the section Creating Endpoints section of Creating Connections with FIREMod Script and the chapter on WiFi Multicast Download. Goal: Create, destroy, start and stop connections and endpoints without needing to use the LANforge GUI. 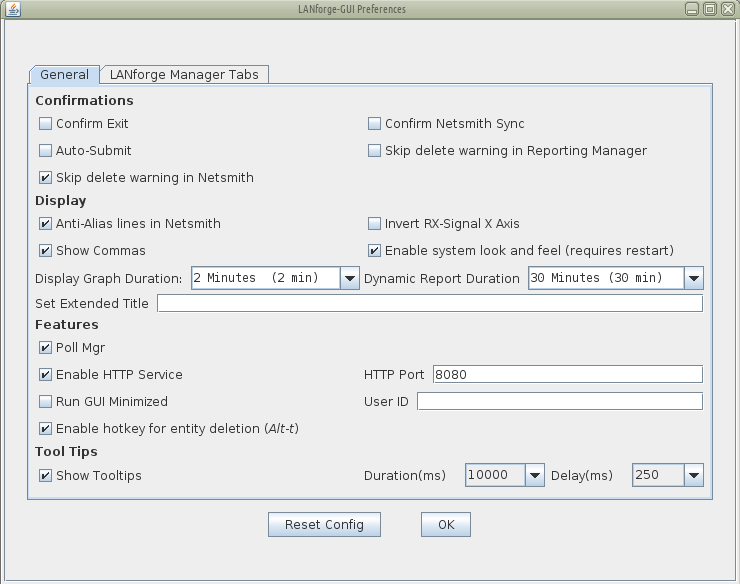 Traffic emulation can be run unattended and using automated tools without use of the LANforgeGUI using Perl scripts provided with the LANforge Server. These scripts can be run from within the LANforge server or outside the LANforge Server (on a Windows desktop). The output of the scripts needs to be redirected into a text file for you to process the results. Controlling Traffic: do_cli, start_endp, stop_endp. To start bi-directional traffic, start both endpoints. Pass direct CLI commands: do_cmd. Use this to help configure aspects of your testing scenario that are options presented in this script. Like secondary IPs on a port. Endpoint Types: tcp, udp, tcp6, udp6. To create multicast endpoint types, use mc_udp and mc_udp6. By default, using the show_endp action shows all endpoints. It might be useful to place output like this right into a file or to immediate use grep to find the rows you want. This is for changing the attributes of an endpoint, such as endpoint TX rate. 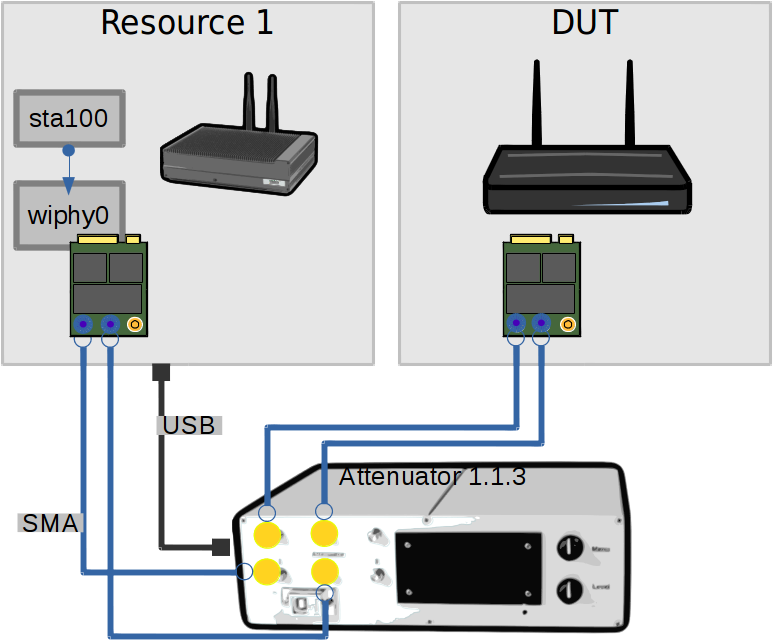 This is pretty useful for getting transmit rate on ports during a connection while not having to use the lf_portmod script. If you do not specify --port_name, all ports will be listed. This is the same as --show_port without the port_name option. 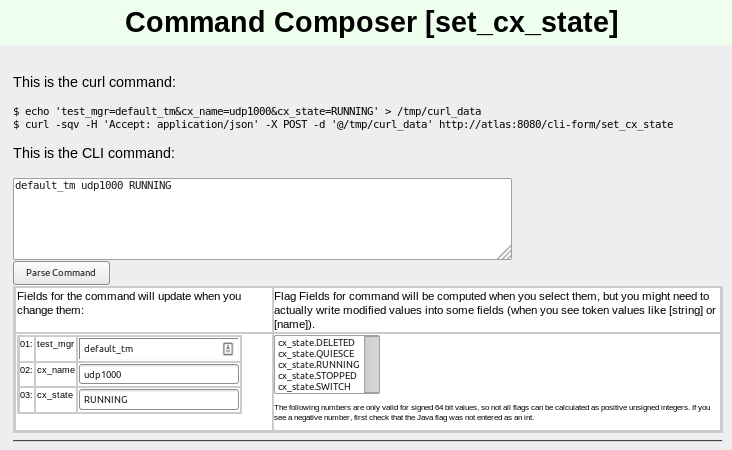 --cmd "set_endp_tos cx_01-A LOWDELAY 10"
See the LANforge CLI User Guide for more info. Remember to remove the cross connect before removing the endpoint. 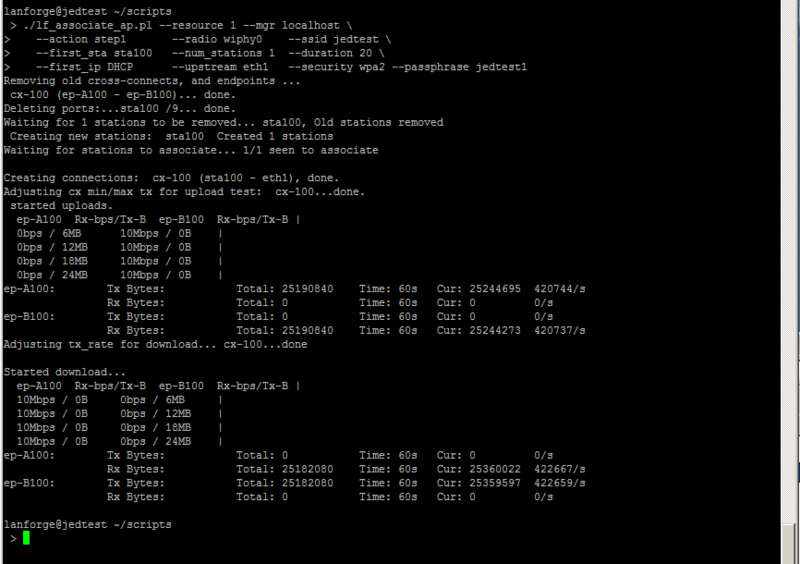 The output of this command begins with the basic stats for the CX and includes the statistics of each endpoint. Remember to delete a cross connect before you delete its endpoints. 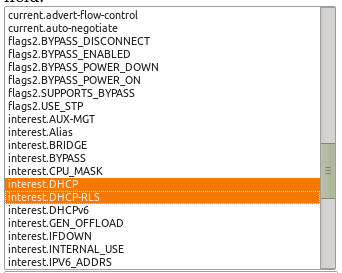 You need to use do_cmd to control Unicast traffic. 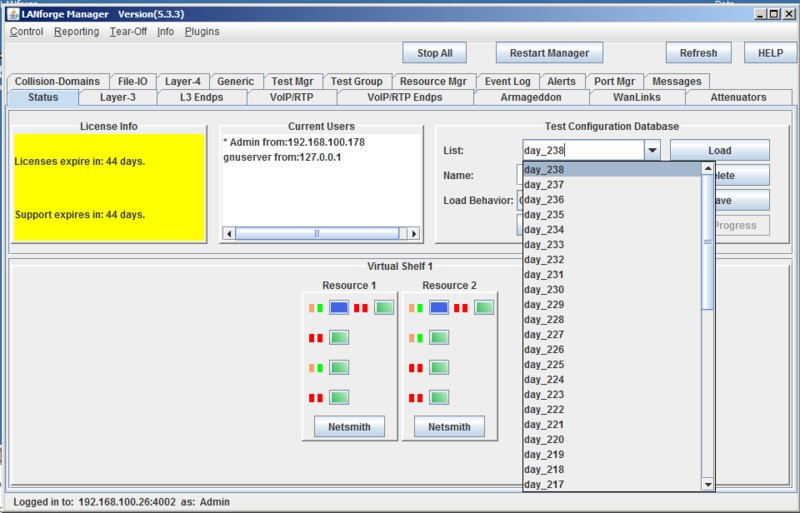 By default, cross connects are created in the default_tm test manager. To control them, you want to specify default_tm in your set_cx_state CLI command. ./lf_firemod.pl --mgr 127.0.0.1 --quiet 0 --action do_cmd --cmd "set_cx_state default_tm cx_0 RUNNING"
There are different options for creating multicast endpoints. --action do_cmd "set_sec_ip 1 1 eth1 10.26.0.20-250/24"
# Not available: Latency,Pkt-Gaps, or rows below steps-failed. Goal: Use the the CLI to operate the Endpoint Scripting features of the Layer-3 Endpoints you create. Layer-3 endpoints can manipulate their own transmission parameters using a variety of internal scripts, known as Endpoint Scripts. Using the lf_endp_script.pl CLI script, you can operate those internal endpoints behaviours. This cookbook talks about Endpoint Scripts and CLI scripts at the same time. In this chapter, if the term script is used, assume Endpoint Script. Additionally, the terms operating and running can also be confusing. To keep the activities distinct, a LANforge user will operate a CLI script from a terminal. The LANforge server will run the Endpoint Script. A CLI script is a user-space perl script that issues CLI commands to a LANforge server. A CLI command is an instruction obeyed by the LANforge server. A managed endpoint of that connection will be configured with an Endpoint Script. The Layer-3 connection starts both endpoints transmitting, one of them starts running it's Endpoint Script that sets it's transmit parameters. Remember: Endpoint Scripts run inside the LANforge server process. CLI scripts run from the client side. We recommend starting your first script off by the LANforge GUI to save an endpoint with an Endpoint Script. 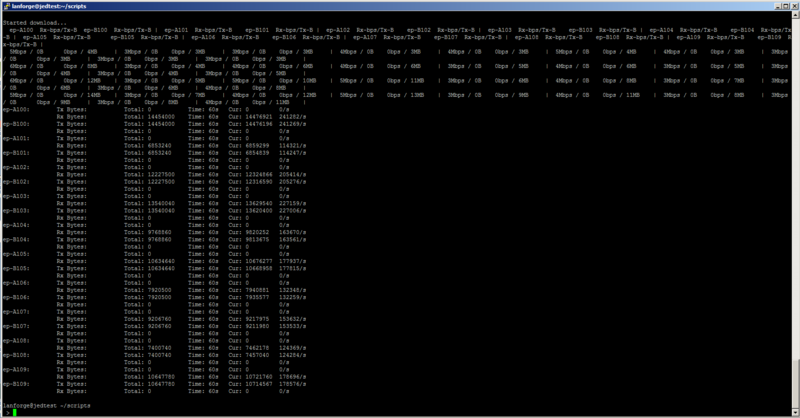 Next, inspect the LANforge database on the server for the script parameters. Take those parameters and adapt them to the operator's CLI script. From the Layer-3 tab, open a connection tutorial-cx, and navigate to box 2. Click on the Script button. In a LANforge terminal, let's look at at /home/lanforge/DB/DFLT/endps.db We will search for bunny-script and we'll inspect the resulting CLI command. --private "5000 5000 100000,20000,100000,20,56000,30000,1,100000, 60,128,256,512,1024,1280,1460,1472,1514 1472 0,100,300,500,550,600,650,700,750,850,900,950 NONE"
In the CMD window, use double-quotes " for quoted script arguments. Using single-quotes will break your command. We could also use action stop_cx to immediately stop the connection. Write these parameters very carefully! Your first mistake is likely going to involve misplaced apostrophes. Associating stations with the lf_associate_ap script. Goal: Create, destroy, start and stop virtual stations without needing to use the LANforge GUI. 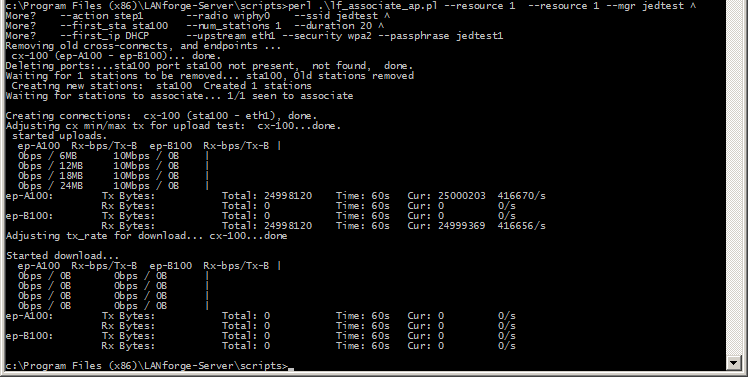 Automated wireless traffic is possible using the lf_associate_ap.pl script. This script can be run within the LANforge server or outside the LANforge Server (on a windows desktop). The output of the script should be redirected to a text file if you want to review the resuts. Use this file in conjunction with the lf_firemod.pl script to create traffic. Requires a LANforge CT520 (or better) system and an access point. Generate stress on the AP by repeatedly bringing up stations and taking them down (action: step2). We assume you have a separate WiFi access point in routed mode. These examples can be used on a CT523 (or better) system with more than one radio if you want to practice the techniques. You would dedicate a radio to be a virtual AP (see cookbook). 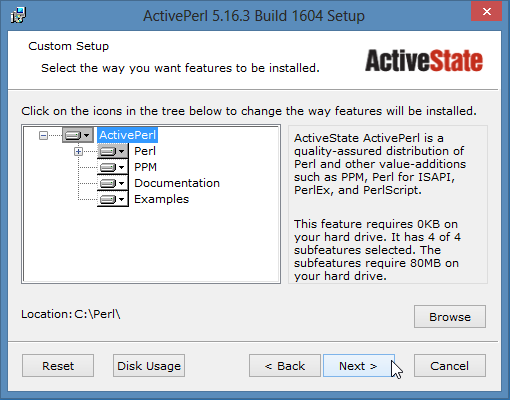 If you want to run scripts from your Windows desktop, you have ActivePerl installed. perl .\lf_associate_ap.pl --help Will show you the script options. We can see the port appear in the LANforge GUI: and we can inspect it. Double click on your PuTTY icon and open a connection to your LANforge machine. The lf_associate_ap.pl script is in the scripts sub directory. Our command is basically the same. Long shell commands and be continued on the next line with the \ character. Both DOS and Linux command output can be saved to a file with the &> operator. Both DOS and Linux files can be viewed with the more command. Initializing your test secenario by pre-loading a database. The database is the same name as the dropdown in the GUI Status tab. Cleaning out your scenario settings after completing a traffic run. We can do this by loading the EMPTY database with the db_postload switch. We can have a series of stations associate and unassociate over and over. This can be quite a bit of exercise for an AP. 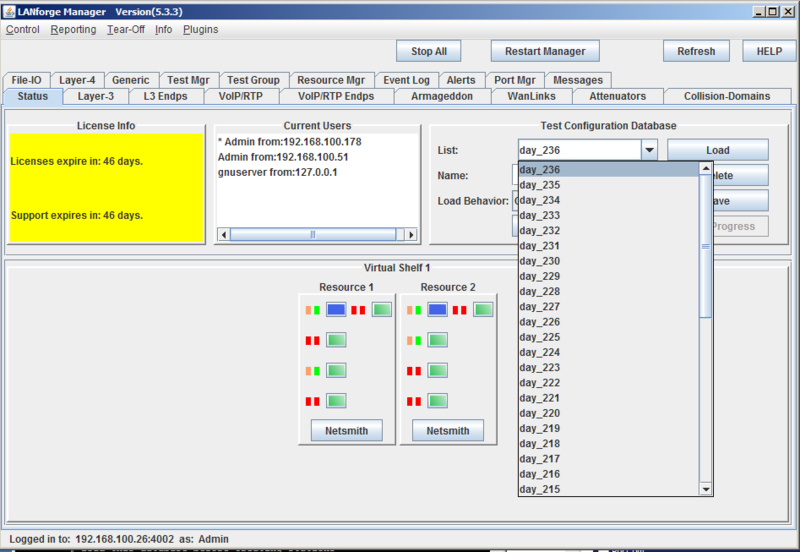 Below is a command that tests five clients connecting. This will create set of ten stations bring them up and then take them down. These might have been update since publication, please check --help output for your version of the script. 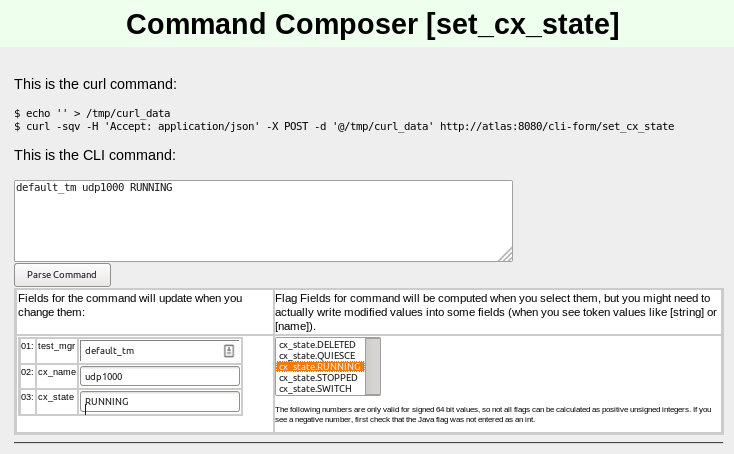 Programatically creating LANforge virtual stations requires using the add_sta command. If you already have a station and need to change the SSID, you still use the add_sta command. Goal: Programmatically change a station's POST_IFUP field. Creating a series of scripts using the lf_associate_ap.pl script is not adequate for negotiating a captive-portal environment, that script does not set the POST_IFUP parameter for the station. However, stations can be modified to gain that field. The above command would never actually be formatted in in the way it appears above. It would all appear on one line without commentds. the LANforge server treats single-quotes (apostrophes, ') as command delimiters. Use only double-quotes (") to quote the arguments to the script. Do not use newlines (\n or carriage-returns (\r\n). That will truncate the command and LANforge will process it immedately. Generating a series of attenuations using data in a CSV file. Goal: Using the script and a specially formatted csv file, you will be able to re-play an arbitrary series of attenuations. 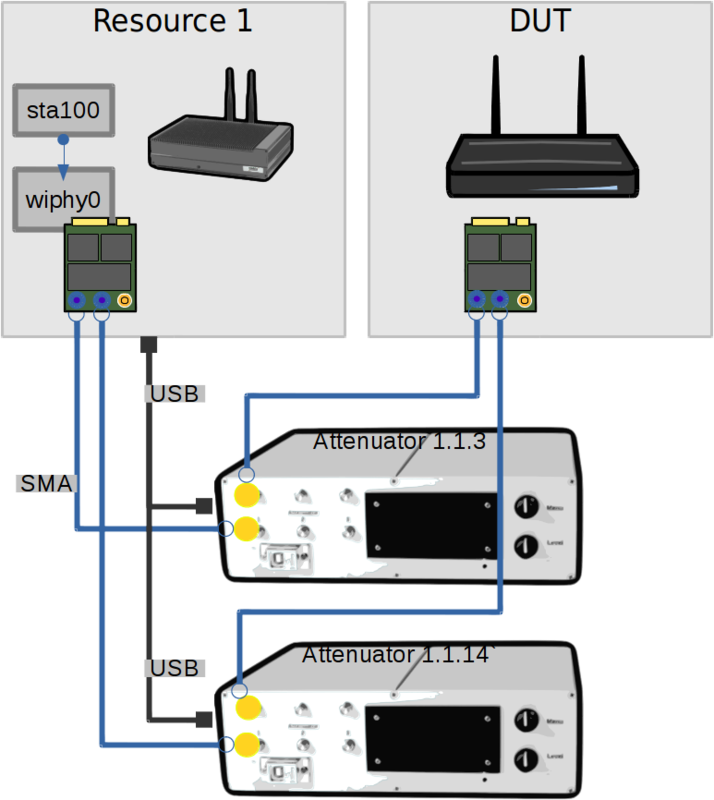 Playing back a series of WiFi attenuation levels using the attenuator_series.pl and a CSV file of attenuations make it possible to emulate the motion of a station (or stations) moving among a series APs. Or it could emulate interference in a crowd of moving people. Requires a LANforge CT703 (or better) and a LANforge CT520 (or better) system, and an access point. Watching a Layer-3 connection in the Dynamic Display, we will see a dip, rise and dip at 10 second intervals. Next we cable up the second channel (1.1.3.1). 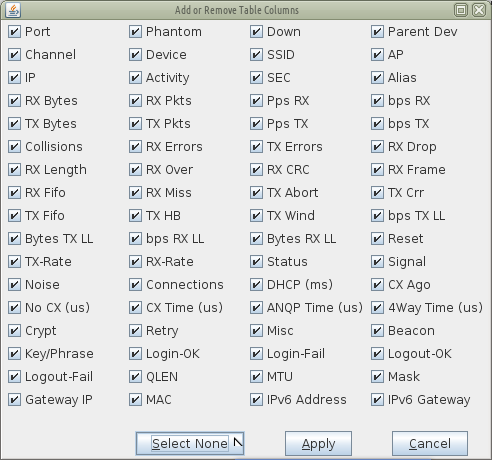 We can update the csv test file, by adding a new column for the channel. 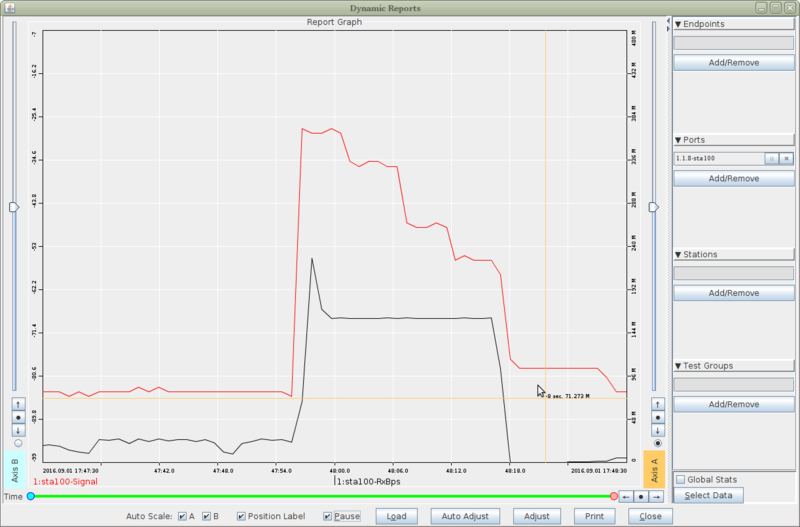 We can run the same command and watch the dynamic reports window to see a similar graph. The first radio on each LANforge is connected in 2x2 mode to both attenuators. This example is drawn to illustrate how you design the connection of your channels independently of their radios. Obviously, you don't need two attenuators for this scenario. However, if you had a CT523 with three radios and want to perform 2x2 testing with three client radios, it is possible to do so with only two CT703 attenuators. Watching the port signal in the dynamic display we will see a rise and dip at 10 second intervals. There is no different in attenuator control whether you have one radio in 3x3 or three radios in 1x1 to control. If you are testing multiple radios, you will be monitoring their RX Signal in the dynamic report. 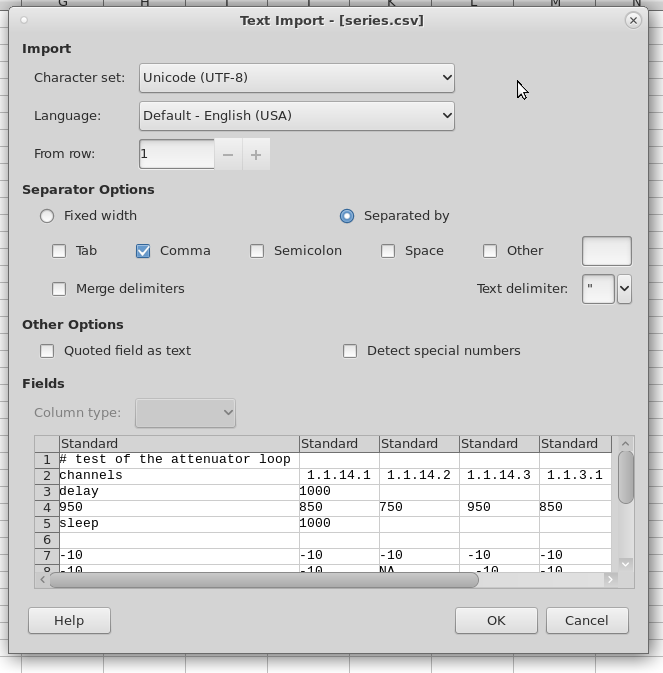 Editing the test data file with a basic spreadsheet program than can save to CSV format is possible. You will want to save with comma format, without double-quoting the cells. These directives are converted to lower-case, so you can type them in UPPER-CASE or Mixed-Case if necessary. The format of the CSV file allows you to specify many options that might also be specified on the command line. Rows that begin with a comment sign (#, ;, !) will be entirely ignored. Cells in column B or beyond will be ignored. Each cell following this directive specifies an attenuator channel to control. The following cells specify an attenuation value for channels specified by the last channels command. Sets the minimum attenuation permitted. Values below this will be set to the minimum directed. Sets the maximum attenuation permitted. Values above this will be set to the maximum directed. Inherently Positive Values, like 200 are absolute attenuation values, in deci-decibels. 200 means 20.0dB. The smallest unit of resolution is 0.5dB, so all your values will end in zero or five. E.G. (0, 5, 105, 200, 955). Values range between zero and 955. Explicitly Positive Values, that begin with @+, ++, + are increments with respect to the last value set on the channel. Results in the channel at 30.0dB. Spreadsheets often omit signed values when saving, so @+ will force a text type cell. Explicitly Negative Values, that begin with @-, --, - are decrements with respect to the last value set on the channel. Results in the channel at 25.0dB. Spreadsheets often omit signed values when saving, so @- will force a text type cell. Basic Cell Math can be performed, but only against absolute cell values. attenuate,=B2+5,=C2-5,     # fails: B2 and C2 were formulas. This feature is unlikely to be as useful as it sounds, because pasting a column of forumae will be pretty useless, since a spreadsheet processes them recursively. Also, most spreadsheets saved to CSV typically don't save formulae by default, you probably will get the computed values in your CSV file. Shortcuts include _, NA, and ,,. You can skip a computation on a cell by leaving a blank cell, underscore, or 'NA'. Careful: the value +0 will likely be truncated to 0, and set the channel to 0.0dB attenuation. This CSV shows a working example that gives warnings. Every port, radio, virtual port, endpoint and connection in LANforge has an ID known as an EID. These are an internal notation that expresses the heirarchy of the physical and virtual objects managed by LANforge realm. You can assume the shelf number will always be 1 for now. The Resource number will refer to the LANforge machine ID as reported on the Status tab. The port id is only unique within a LANforge machine. 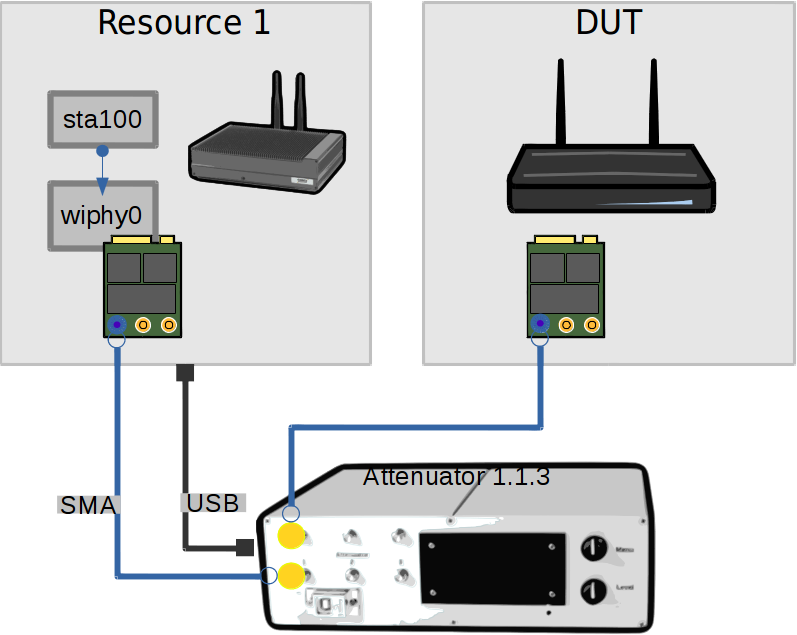 The port ID also refers to hardware in a machine: radios get a third decimal. The fourth decimal refers to either endpoints or connections. While some items with port numbers, notably radios and ports, do not generate traffic. Endpoints generate traffic, and typically endpoints are transmitting to an opposite endpoint. The exception to this are multicast endpoints. An endpoint resides below a physical or virtual port. The exception is connections. Connections are numbered outside of this heirarchy. Do I use EIDs in Scripts? 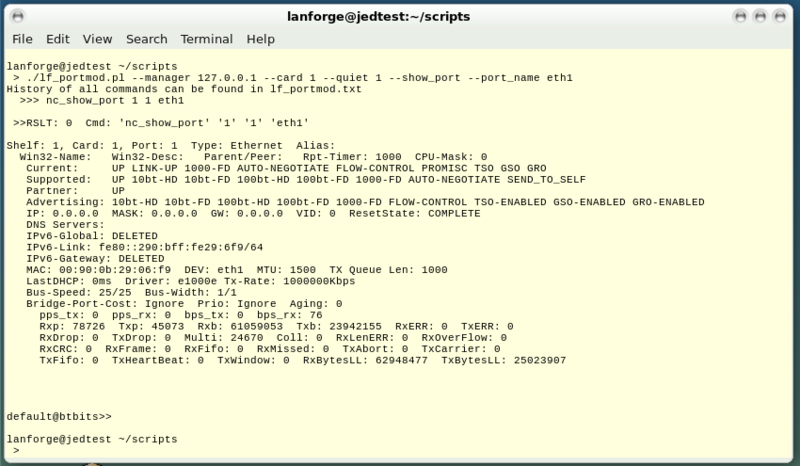 EIDs are generated at LANforge manager start time, and might depend on the detection order of ports when the PCI bus on the host is enumerated at boot time. 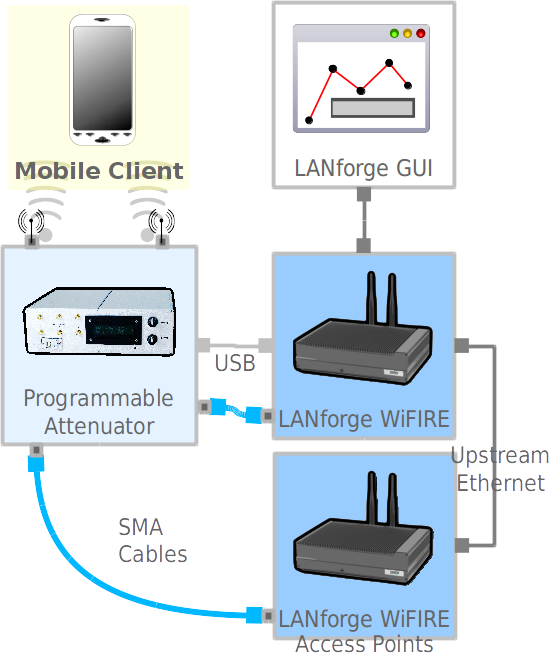 New devices can be hot-added to a LANforge resource, like a programmable attenuator or a USB-Ethernet adapter, generating new Port IDs. In scripts, it is legal to reference port numbers, but not advised to store them between sessions. If you reference an EID, it should be from within your present LANforge session. If your resources tend to disappear off the network and return (you had a machine reboot) those EIDs are not guaranteed to return. 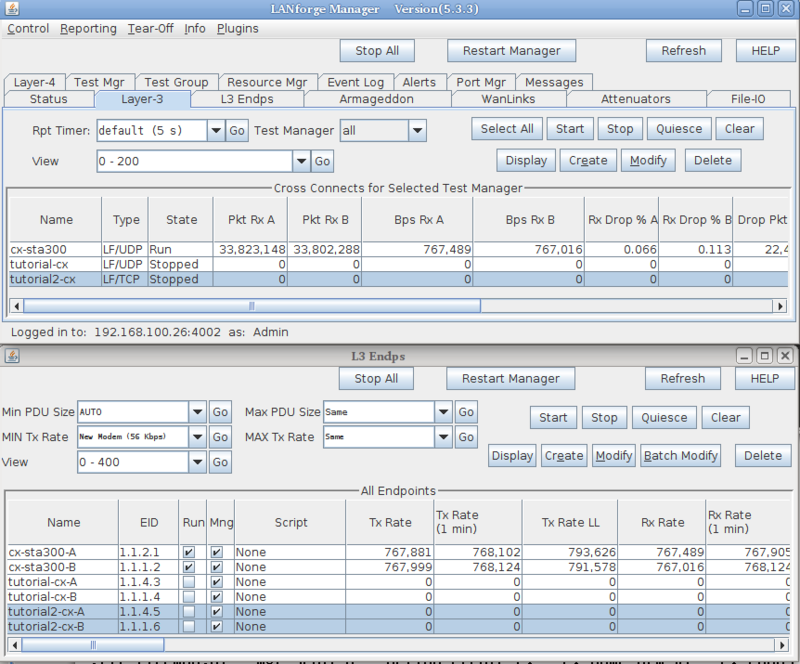 For ports, only the first two decimals (shelf and resource id) are actually stable across machine reboots. Goal: The LANforge GUI now has an embedded webserver and a headless mode of operation. Read on for how to configure and query the client for JSON formatted data. Updated 2018-07-24:New features in 5.3.8. More rapid polling: using CLI scripts to poll ports on the LANforge manager can add stress and contention to the LANforge manager; polling the GUI will not tax your test scenario. 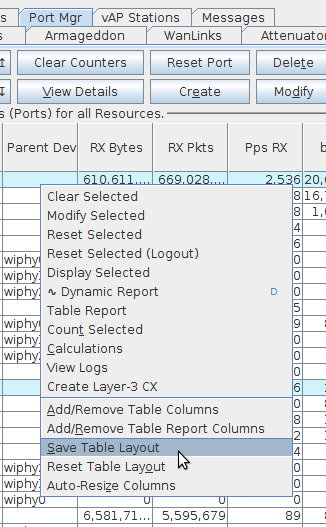 Expanded array of data: the views found in the GUI, like Port Mgr and Layer-3 tabs, contain synthesized data columns not available through the CLI scripting API. Most of these columns can be returned in JSON format. Reduced effort when integrating with third party test libraries: many other testing libraries expect JSON formatted input. 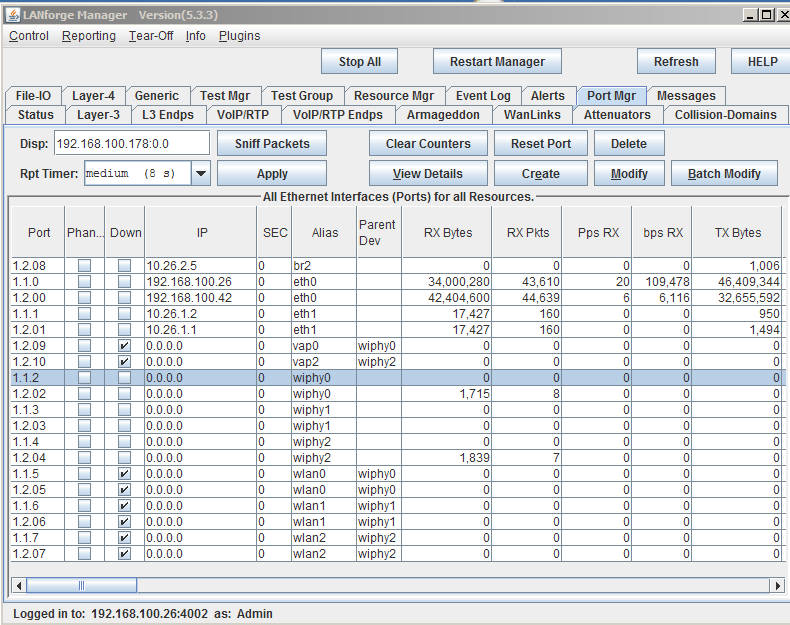 Web socket delivery of event data allows real-time reporting of interface changes and station scan results. This is also a channel for querying additional diagnostic data. There is a /help web page that allows you to build POST commands. A headless -daemon mode that will run the client without any GUI windows. This requires much less memory and has been queried for weeks at a time without crashing or memory leaks. Actively being developed: the JSON views/schema of the objects is at a demonstation state. URLs and JSON structures have changed in 5.3.8. Now no longer possible to create Groovy plugins to add JSON features if you want to use the headless mode. JSON Features are compiled into the LANforge GUI from Java sources. 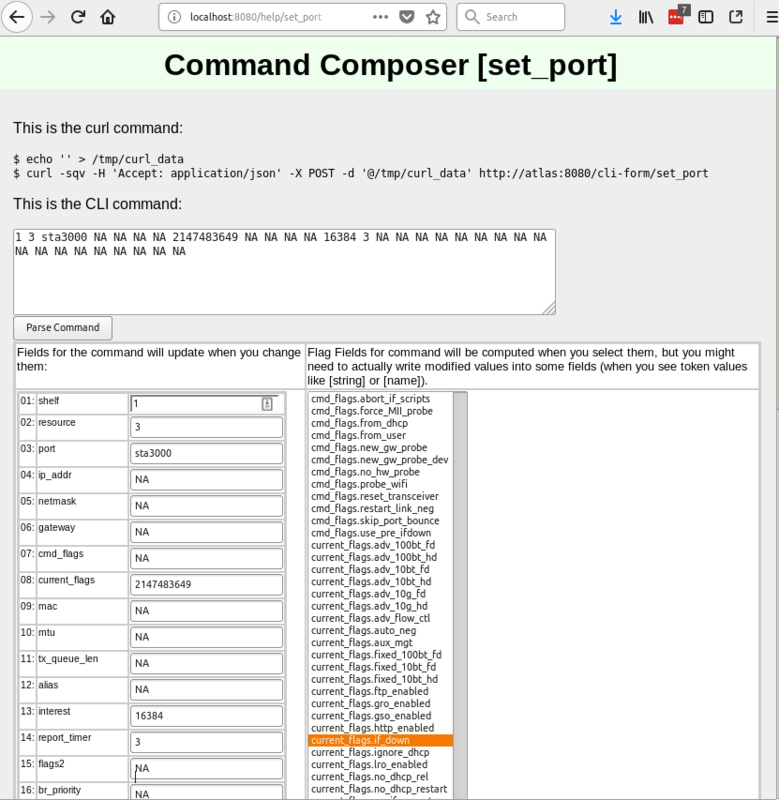 In 5.3.8 we have limited the view of ports, have added URLs to post direct CLI commands, and have applied HTML application/x-www-form-urlencoded form posting submissions in name/value pairs. There is no multipart/form-data JSON submission at this time. There is a setting in the 5.3.8 Control→Preferences menu for setting a minimized mode and the HTTP port number as well. 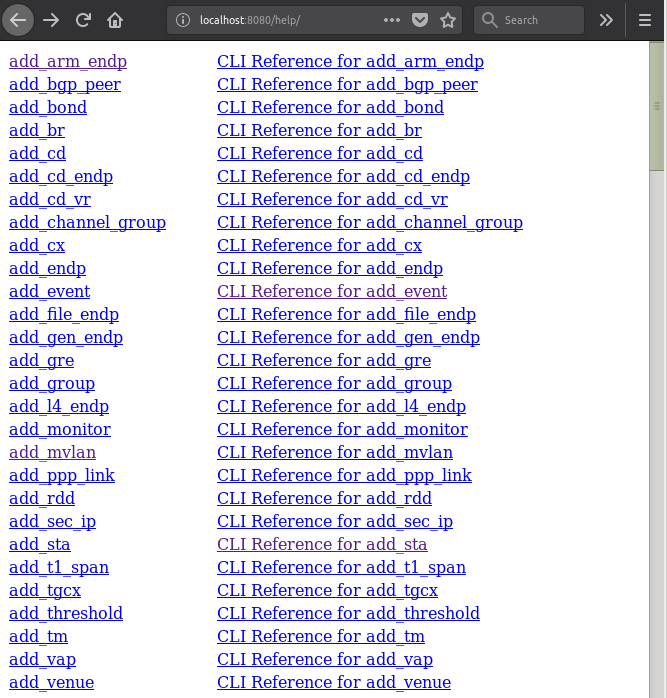 This first page (/) will give you a JSON list of the resource URLs available. Most URLs will provide JSON as their default content type. Notably, /help defaults to HTML. 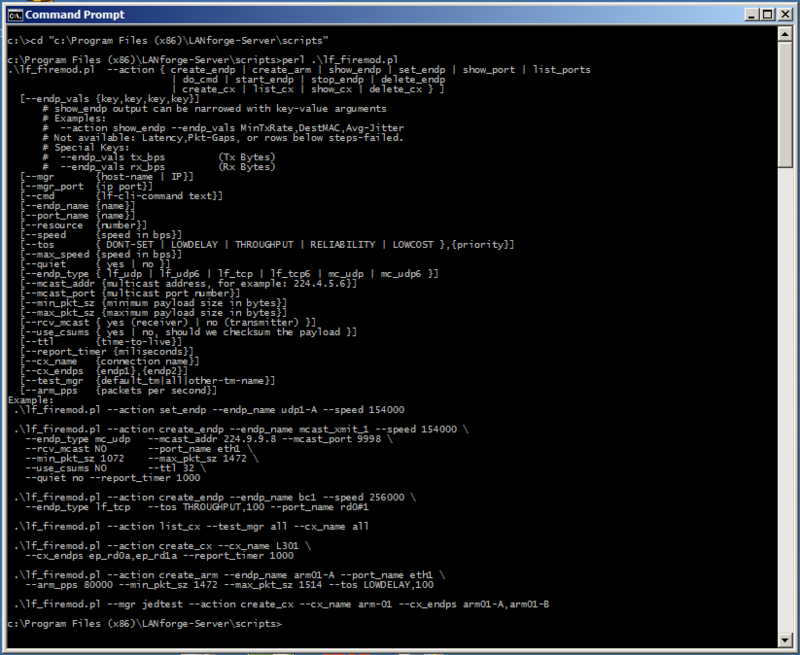 Clearly, the JSON output is difficult to read. We cover formatting output below. 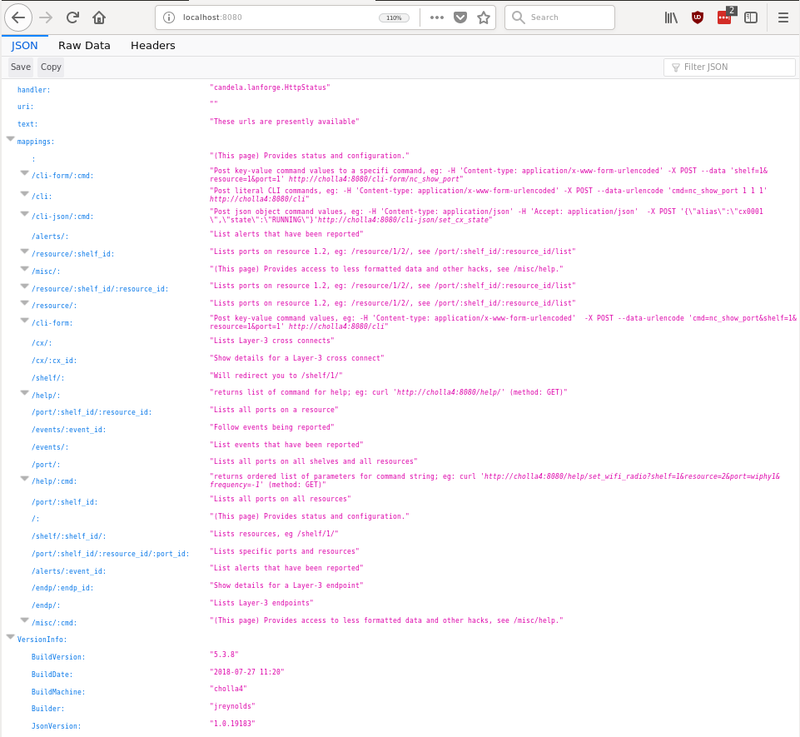 JSON formatted text is pretty difficult to read, there are a few different utilities that can help you look at it: jq, json_pp, json_reformat, tidy, xmllint, yajl and jsonlint. Notice that the URI object list paths with colon-tagged positions in them, e.g. : /cli-form/:cmd. These are interpreted as URL parameters and not query string parameters, they cannot be moved into the query string. A busy LANforge system will generate hundreds of thousands of events. Only the last few thousand can be recalled. We can view /alerts similarly. Continually polling the /events URL is not as effective as streaming a websocket providing the same data. We need a web socket client. 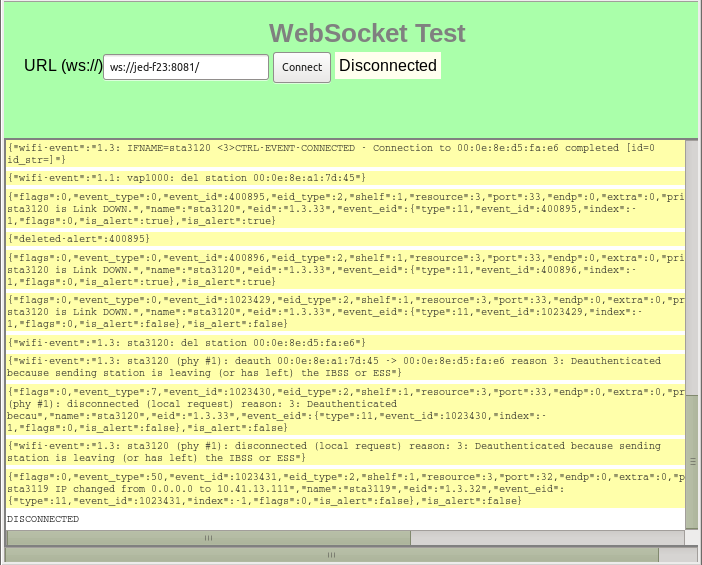 Websockets are built into modern browsers and there are python and perl utilities for the job as well. An easy to use python client is wsdump. Here's an example of wsdump below. Don't forget you are now using h the ws:// schema and not the http:// schema! It might take a few second to start showing results if your system is not very active. You should be able to prompt output by executing this message in the Messages tab: gossip hi ben! 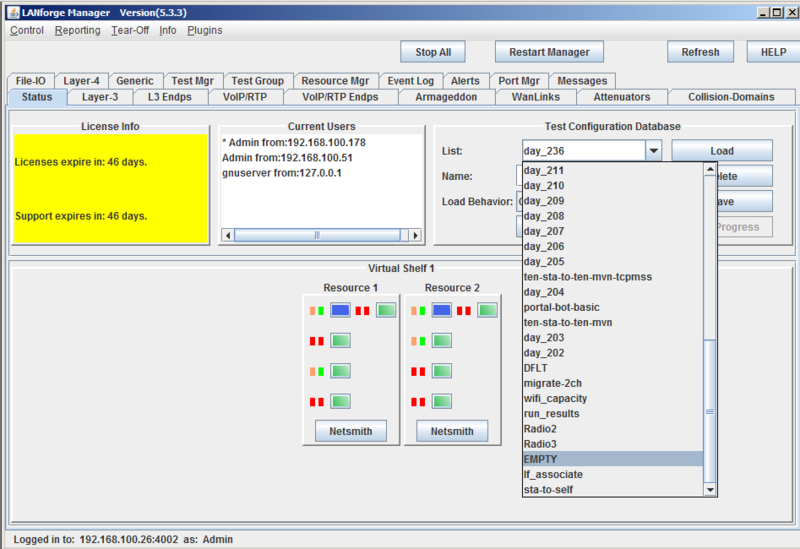 The /resource URL provides a digest of ports available at the requested resource. We can query multiple ports at a time by their number or their name by placing a comma between the specifiers. Additionally, we can query for just the fields we desire. All field names are lower-case: ?fields=tx+crr,rx+fifo. The /cx URL allows us to query Layer-3 connection information. Technically, colons in URLs need to be encoded as %3A, so the above URL should be /cx/udp%3Ar3r2%3A3000, but curl is pretty darned forgiving. Then check your LANforge GUI messages. Except for /cli-json, these methods accept application/x-www-form-urlencoded content type submissions. This is default for the NanoHttp library and default for curl. These CLI commands do not return data, only a result code. 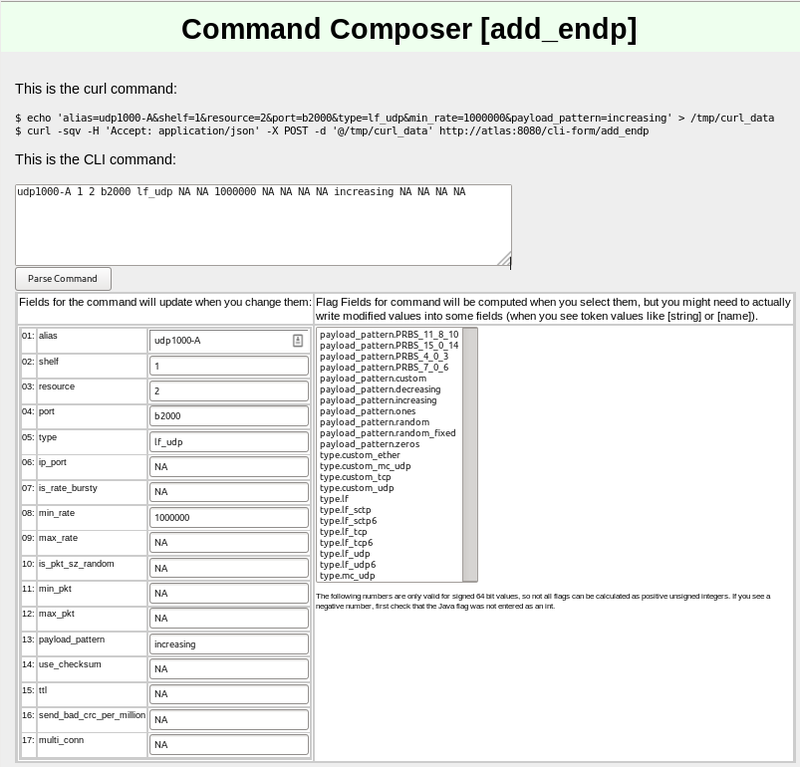 All data that the Perl scripts would collect from command line queries is sent directly to the GUI. Some CLI commands send data over the websocket, like the diag command. Commands are often complex and include a number of bitwise flags to set the state and features of ports. There is presently no tag-substitution for port flags, but there is a help utility that can help you compute them. You may find a list of flag fields that are organized by field names. The text area below the selection list is the sum of the selected fields. Copy the flag values into the input field above to incorporate it into your command. These will provide ways of collecting the CLI commands in log files for you to place into the command /help/ page. Verify with the LANforge GUI the changes you wish to make. 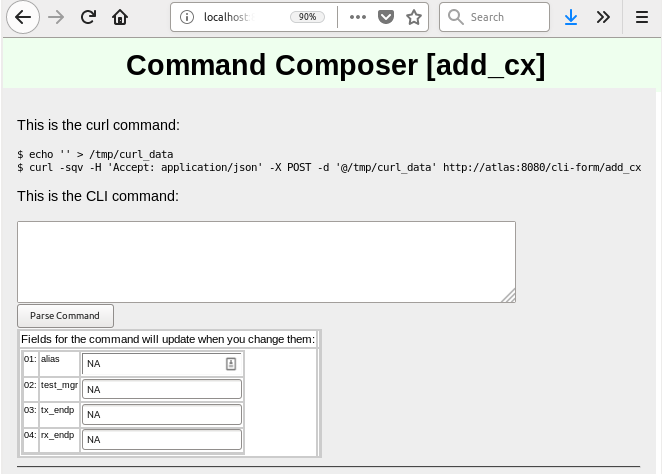 Using the /cli-json/add_endp and /cli-json/add_cx URLs, it is possible to create Layer-3 connections. Create the Layer-3 endpoints first, of course. With the creation of two endpoints, we can proceed with creating a Layer 3 cross-connect. This is much simpler, it really only takes the names of the two endpoints we created above. We'll choose default_tm for the test manager. Click the Parse Command button and copy the resulting curl command into your editor with the shell script. Run the script again. It doesn't hurt to re-create the endpoints. Click Parse Command and then you can paste the resulting command into your editor. You can make JSON submissions and you can also submit Base64 encoded values in both form an and JSON submission URLs. Below is a CLI command example. You typically would not care to spend the effort doing this unless the data you need to express is difficult to URL encode. Instead of posting to /cli-form, you can post to /cli-json and your submission will be parsed as a json object. The parameter names stay the same. The base64 name extensions are also available! You need to specify that your Content-type in the POST is application/json. (This should be fixed as of 2018/08/14) When the LANforge cliet is in GUI mode, the columns of data that are returned match the GUI table columns displayed. You can use the Right-click→Add/Remove Table Columns menu item to change this. We do not recommend doing this for querying JSON data though, because the table columns definitions will not match up to the data the webserver expects to return. "names_to_col_ids map is not going to work:\n[tx abort][25 > 4]\n[cx time (us)][48 > 4]\n[bytes rx ll][33 > 4]\n[bps tx][14 > 4]\n[channel][39 > 4]\n[no cx (us)][47 > 4]\n[rx frame][22 > 4]\n[login-fail][58 > 4]\n[tx hb][28 > 4]\n[mode][40 > 4]\n[anqp time (us)][49 > 4]\n[rx pkts][8 > 4]\n[bytes tx ll][31 > 4]\n[key/phrase][56 > 4]\n[signal][42 > 4]\n[connections][44 > 4]\n[ipv6 gateway][68 > 4]\n[time-stamp][69 > 4]\n[entity id][70 > 4]\n[bps rx ll][32 > 4]\n[rx errors][16 > 4]\n[tx errors][17 > 4]\n[pps tx][13 > 4]\n[rx over][20 > 4]\n[ap][38 > 4]\n[mtu][63 > 4]\n[qlen][62 > 4]\n[beacon][54 > 4]\n[rx drop][18 > 4]\n[tx wind][29 > 4]\n[reset][34 > 4]\n[device][61 > 4]\n[status][37 > 4]\n[activity][41 > 4]\n[cx ago][46 > 4]\n[crypt][51 > 4]\n[rx crc][21 > 4]\n[ipv6 address][67 > 4]\n[logout-ok][59 > 4]\n[parent dev][6 > 4]\n[ssid][55 > 4]\n[tx-rate][35 > 4]\n[mac][66 > 4]\n[login-ok][57 > 4]\n[4way time (us)][50 > 4]\n[logout-fail][60 > 4]\n[rx miss][24 > 4]\n[rx fifo][23 > 4]\n[noise][43 > 4]\n[alias][5 > 4]\n[tx pkts][12 > 4]\n[tx crr][26 > 4]\n[rx length][19 > 4]\n[dhcp (ms)][45 > 4]\n[retry][52 > 4]\n[misc][53 > 4]\n[mask][64 > 4]\n[tx bytes][11 > 4]\n[tx fifo][27 > 4]\n[collisions][15 > 4]\n[pps rx][9 > 4]\n[gateway ip][65 > 4]\n[bps tx ll][30 > 4]\n[rx bytes][7 > 4]\n[bps rx][10 > 4]\n[rx-rate][36 > 4]"
Right-clicking the Port Mgr and selecting Add/Remove Table Columns will allow you to change this. Clicking the Select All/None button and then Apply will get all the columns displayed, and returned in your queries. Make sure to Right-Click → Save Table Layout so that your next session will show all the data. Learn CLI commands used to operate WiFi stations. Goal: Compare and learn script and CLI commands used when creating and operating stations. --cmd "set_port 1 2 sta200 NA NA NA NA 0 NA NA NA NA 8388610"
Requires a LANforge CT520 (or better) system and an access point. This was done in a two-machine LANforge cluster, the manager named jedtest and the second resource named kedtest. The CLI output of these CLI commands has been discarded as well as any show_port commands. 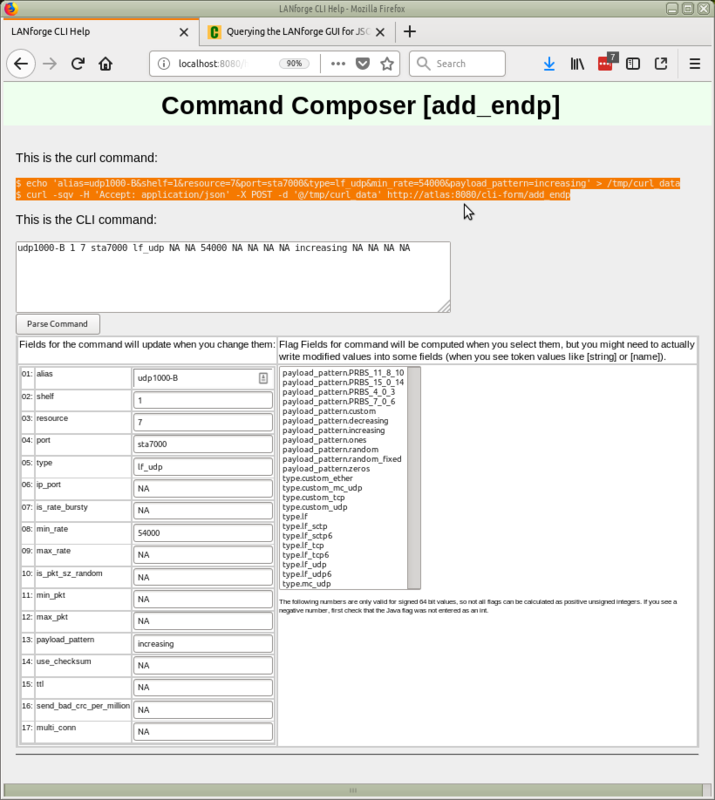 The show_port commands are useful for inspecting the results of previous commands. Often there is useful wait before issuing the show_port command to allow processing time on the manager. Please inspect the scripts in the /home/lanforge/scripts directory for how and when they tend to sleep. These commands are also found in the /home/lanforge/DB/DFLT directory files. You cannot run those DB files directly, because they are executed in certain order. However, you can grep for connection- and station-names in those files to find results of GUI commands. This station is created with DHCP enabled. 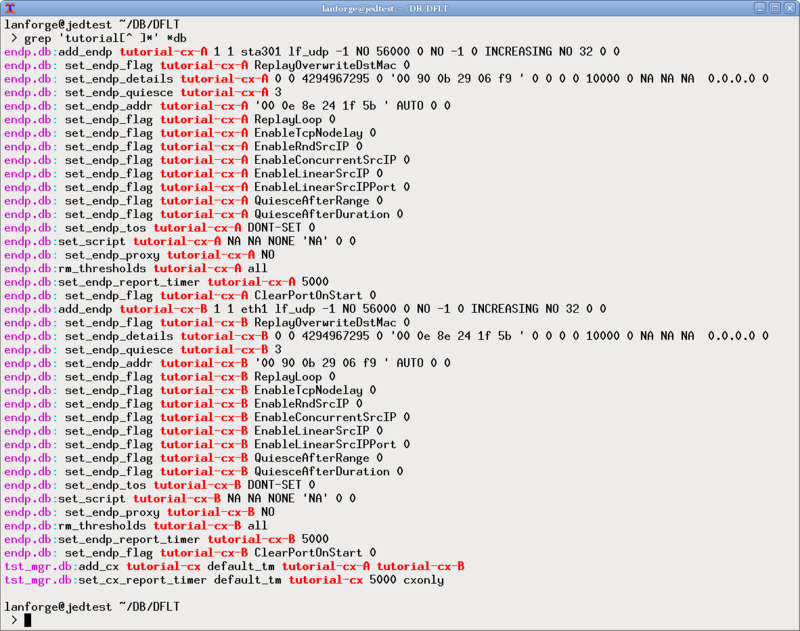 That is controlled via flags that are descibed in the add_sta command. For the station to gain a DHCP IP address, you have to admin-up the station. 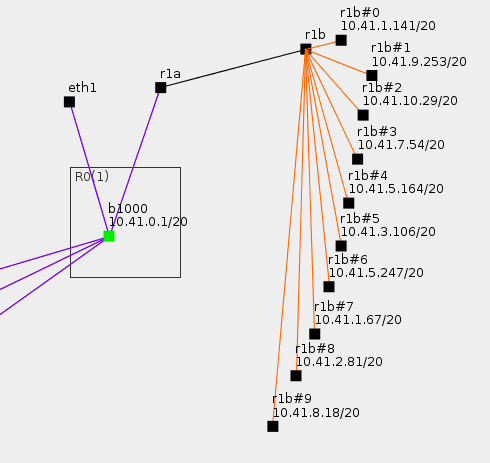 The lf_associate_ap script contains logic that parses a MAC address pattern and produces new MAC addresses. This is not a feature of the LANforge Manager. Your CLI calls to the LANforge manager will not parse the mask. LANforge can create Layer-3 and Layer-4 connections using the lf_vue_mod.sh script. When connections are created, they exist in a stopped state. Connections can then have their state changed to RUNNING to start traffic. Layer-3 and Layer-4 connections both subject to the states STOPPED, RUNNING, and QUIECSE. ./lf_firemod.pl --mgr jedtest --action do_cmd --cmd "set_cx_state default_tm tcp200 RUNNING"
./lf_firemod.pl --mgr jedtest --action do_cmd --cmd "set_cx_state default_tm tcp200 STOPPED"
Layer-4 connections are created with a one-sided technique, the curl command always operates on the A-side and the B-side is unmanaged. The endpoint and connection naming does not follow the Layer-3 convention. Learn CLI commands used create Generic endpoints. Goal: Compare and learn script and CLI commands used when creating and operating Generic endpoints. Similar to the Layer3 perl script, lf_firemod.pl, the lf_generic_ping.pl script has been enhanced to use curl or other commands with parameter expansions. The lf_curl.sh script is a helper script that wraps curl commands and reports success or failure. Generic endpoints are effectively one-legged connections. You can ping an IP or use curl to download web content. Both of these types of connections can be pointed back at the LANforge itself. We can operate these connections from redirect interfaces. The same techniques can apply to WiFi stations, of course. To use other commands with the script, you can create a --cmd parameter. You can use curl directly if desired, but curl's output is not formatted well for LANforge to understand. By default, commands do not understand what port or IP they should be interacting as. We need to provide special parameters to help. %i Expands to the IPv4 address of the port. The scripts/lf_curl.sh script is a wrapper for curl that detects success or failure, and an operate the request in a loop. Expandable parameters are expanded by lf_generic_ping.pl, not lf_curl.sh.